Posted November 8th, 2012 at 4:04 pm. Not every dominant plant today will be dominant under climate change–but some may because of an advantage. Plants better at altering their anatomy and physiology can come out ahead under a wide range of environmental changes, according to a study by Bryn Mawr Assistant Professor of Biology Thomas Mozdzer. Mozdzer worked with ecologist Patrick Megonigal on the study during his time at the Smithsonian Environmental Research Center (SERC) and it was published on Oct. 31 in the journal PLOS ONE. Mozdzer and Megonigal studied plants called “jack-and-master” plants. Typically, the most competitive plants surpass their neighbors through one of two strategies. “Jack-of-all-trades” plants do moderately well under most scenarios. Their competitors will surpass them when conditions are good, but if the environment becomes stressful, the jack-of-all-trades will grow better. “Master-of-some” plants do very well under only a few conditions, so if the environment shifts in their favor, they are certain to emerge victorious. But a few types–the jack-and-master plants–can do both. 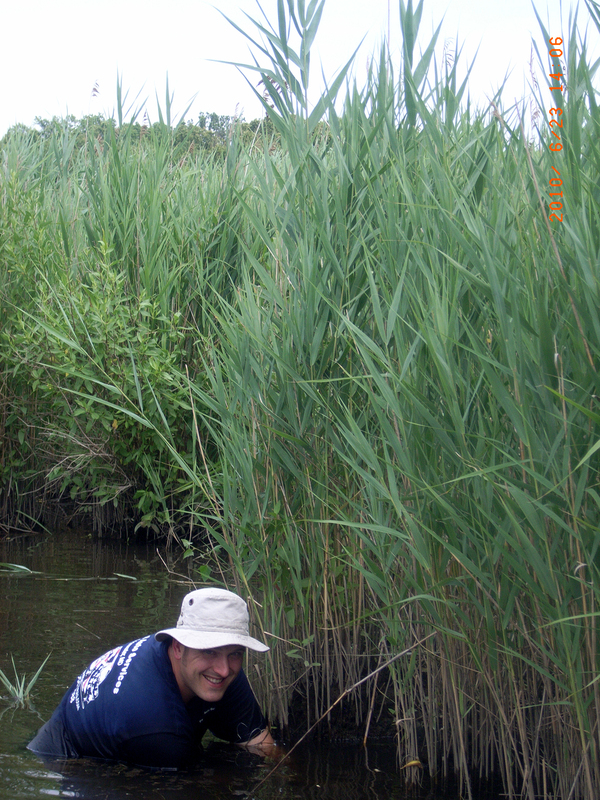 Assistant Professor of Biology Thomas Mozdzer works beside a patch of invasive Phragmites australis at SERC’s Global Change Research Wetland. For their study–the first study to test how invasive jack-and-master plants do under climate change–Mozdzer and Megonigal looked at the invasive reed Phragmites australis. Phragmites ranks among the most rampant plant invaders in the eastern U.S. It spreads rapidly and grows up to 15 feet tall, cutting off access to light and nutrients so nothing else can survive in its shadow. However, prior to this study, scientists did not know how it would fare as climate change accelerates. Mozdzer and Megonigal examined two different strains of Phragmites: the introduced invasive strain from Europe and the native North American strain, which has enjoyed considerably less success. They grew 52 samples (27 native and 25 invasive) in a SERC greenhouse. Then they exposed them to one of four treatments: elevated CO2, elevated nitrogen, elevated CO2 and nitrogen combined, and a control treatment. After two months, they inspected each plant to see how they changed. Far from being held back, invasive Phragmites gained roughly 40 percent more biomass under higher CO2. With CO2 and nitrogen combined, it shot up almost 300 percent. These values suggest the potential for success in the near future, and Mozdzer and Megonigal are testing this hypothesis in a field experiment. The critical factor was flexibility–the hallmark of a jack-and-master plant. The invasive strain was able to change parts of its anatomy and physiology to fit its environment much more than the native strain. For example, when CO2 levels increased, the leaves of the invasive Phragmites thickened, allowing them to grow more with less water. When nitrogen levels in the soil rose, invasive Phragmites responded by growing fewer roots and more shoots. When nitrogen was limited, the invader changed its metabolism to maintain high growth. In all three cases, the native strain showed little or no variation whatsoever. However, Phragmites‘ greatest biomass gains came from higher nitrogen, indicating a possible strategy for controlling further invasion of this plant. Material for this article was provided by the Smithsonian Environmental Research Center.